The school principal of Wat Bot Sueksa School in Wat Bot district in Phitsanulok was accused of harassing six pupils. About 100 students from the said school gathered at the school premise demanding their school principal Samarn Sareekham’s removal. 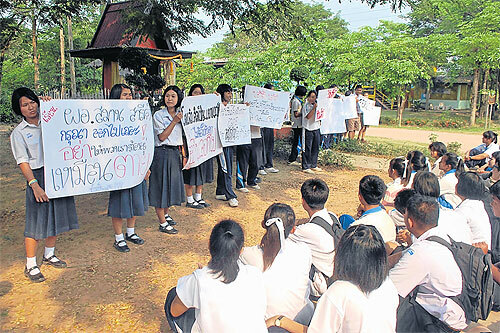 A Mathayom 6 (Grade 12) student who goes by the name of Ploy, led the protest and said the principal had harassed six students, mostly Mathayom 2 and 3 students. She said Mr. Samran groped their arms and fondled their hair. He even joined the group of female students talking about their dreams and shared an indecent story that he dreamed, she added. One of the girls said she was offered by the headmaster a free ride home but she was taken elsewhere. He told her not to tell her parents and he used to call her every Friday. The girl also added that Mr. Samran let her play with his tablet computer while driving and claimed he tried to touch her. Although Ploy thinks that Mr. Samran’s action was highly inappropriate and unacceptable, she didn’t consider his behaviour to be tantamount to sexual molestation. The students dispersed and attended their classes when they were told by Mr. Suchon who works at Secondary Educational Service Area Office 39, that the allegations would be investigated. Mr. Samran will be transferred to an inactive post from today and will be moved out of the area within two weeks.